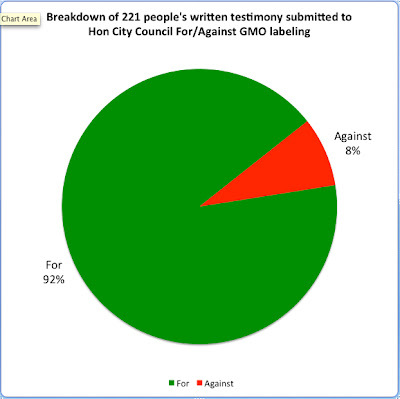 Like a lot of people, I was disappointed that the Honolulu City & County left mandatory GMO labeling out of its Resolution 11-339 which will go to the State Legislature for action. The other three counties (Kaua‘i, Maui, and Hawaii Island) included that in their draft of the Hawaii State Association of Counties Legislative Package that the Hawaii Legislature will look at in 2012. And like a lot of you, I sat through the hours of testimony that were overwhelmingly FOR the mandatory labeling of GMO products. There was a lot of written testimony submitted too, and I wondered how many were for GMO labeling, and how many against. I do notice State Senator Maile Shimabukuro (District 21, Leeward Oahu) submitted testimony FOR. Yay Maile! Now let's get our stuff together for the Legislative session. Any suggestions? GMO has got to GO! "I did. I separated them - I had 9 out of 10 for labeling. About three inches of paper- written testimony to document the people should have a right to know. Tom Berg"
I'll post any other responses I receive from Councilmembers. 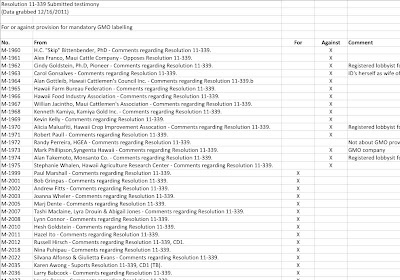 Update of 01/18/2012: If anyone would like to keep track of efforts to regulate or label GMO during the 2012 Hawaii legislature, join GMO-FREE OAHU on Facebook. It's a small group now but can be used for legislative updates, communication, and discussion. Thanks Doug! Eye opening statistics. Why indeed did the City Council not rule in favor of the overwhelming majority? We all need to be vigilant to keep our elected representatives from serving powerful corporate and special interests at the expense of the people. Go Doug !!! Thank you for your vigilance. Please continue to monitor the situation and distribute your findings. The greed of the international conglomerate corporations should not be allowed to cause more damage.